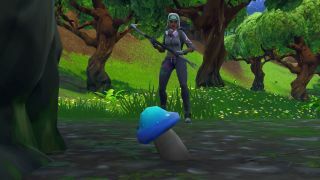 Fortnite Mushrooms are one of an increasing number of consumable items to appear in Fortnite, and if you're looking for a small boost to your shields then they are a handy way to add 5 to your total for each one you chomp down. Admittedly this is not exactly huge when compared to the effects of the different shield potions, but if you need a quick top up and don't have the appropriate vial in your inventory then these 'shrooms will definitely help you out. They also come into play for one of the Fortnite Battle Pass Challenges in Week 5 of Season 8, which requires you to gain a total of 50 shield from eating that funky blue fungus before you can move on to the next stage of the challenge. Follow our lead, and we'll show you all of the locations you can find some Fortnite Mushrooms and keep that shield nicely boosted. Although we've found Fortnite Mushrooms in these locations, there's no guarantee they will definitely be there for you. As well as the random spawning mixing things up, there's the chance that hungry opponents may have already passed through and nommed the 'shrooms themselves. Instead, you should treat the above map as a rough guidance of areas to check, but don't be too disappointed if you come up empty-handed as there's plenty of other locations to check. When you're in the vicinity of these areas, have a look in the shady spaces (normally underneath trees) and you should be able to spot the distinctive blue glow of a Fortnite Mushroom ripe for eating. If you've already boosted your shield up to 100, then you won't actually be able to consume any Fortnite Mushrooms as they can't have their desired effect on you. Counter-intuitive as it may be, you'll need to give yourself a small amount of self damage, but this can't be fall damage as that only reduces your health and not your shield. If you have an explosive weapon you can try to detonate it near yourself to reduce your shield with the splash damage, but for the purposes of this challenge it's best to make sure your shield doesn't go above 50, allowing you to nosh the fungus and tick another Mushroom off your tally. Looking for more Fortnite help? Then check out our essential Fortnite tips to help you edge ever closer to that coveted Victory Royale spot.